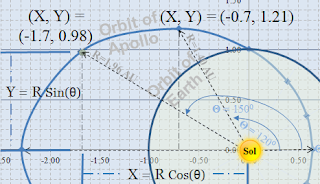 JPL Horizons has excellent orbit drawing tool. 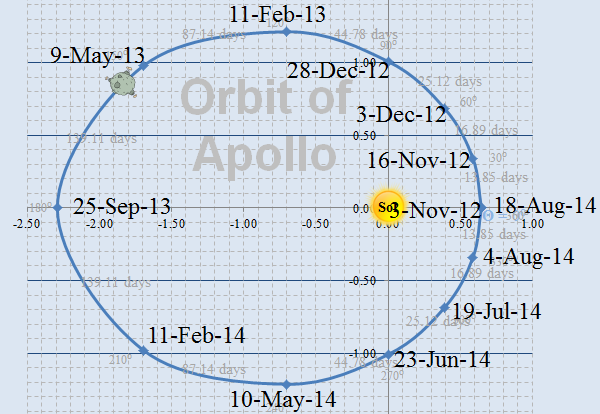 an asteroid discovered in 1932.
near Earth's orbit at the ascending and descending nodes. 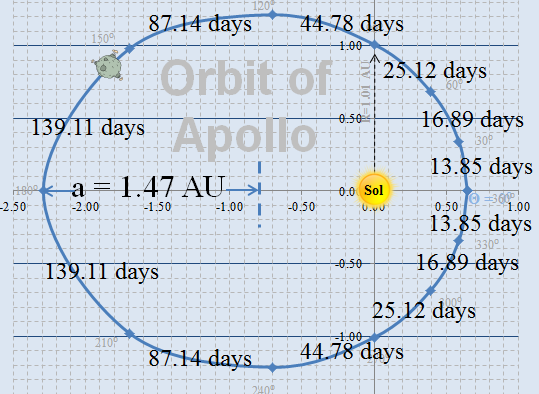 to the furthest distance from Sol (aphelion, Q). 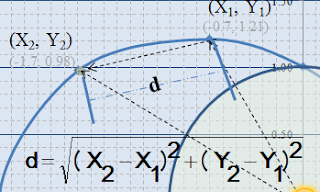 Common convention places reference ray (θ=0°) toward q. Thus, θ = 180° points toward Q. 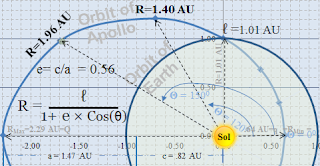 All other angles in each semi-orbit have unique distances. can be computed for any point on the orbit. 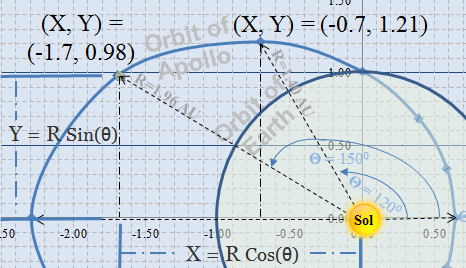 Artificially assume altitude (Z) to be zero. 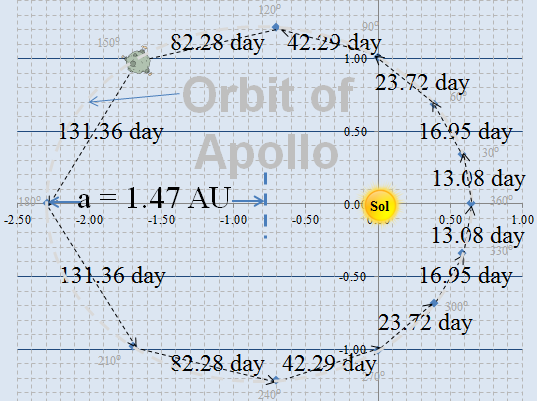 use Apollo's orbital plane as the reference). direct distance between any two points on a Cartesian coordinate system. the hypotenuse will be the straight distance between the points. 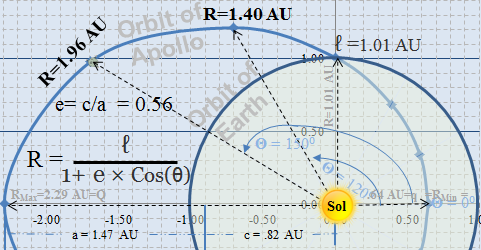 at precise positions where angular rays intercepts the orbit. (as shown in the diagram to the left). for point to point durations. Convert durations from seconds to days (divide by 86,400 sec/day). 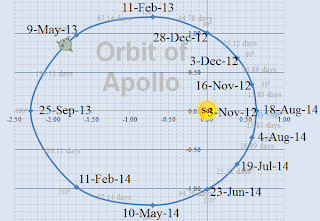 For 30° segments of the orbit, compute straight line distances and corresponding travel times per Step 6. Sum these times for 617. 35 days or 1.69 yrs. Square of Period relates to cube of Semimajor axis. To more closely approximate object's travel times, adjust object's travel time for each 30° segment. Increase each segment's travel by 5.9% as shown in tables. 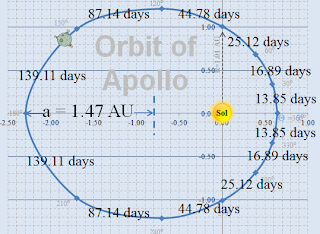 As expected, adjusted sum of these segments becomes 653.8 days or 1.79 years, known period of Apollo, Asteroid 1862. For increased accuracy, redo Steps 1) through 9) for 10° increments. Following examples show results from 120° to 150°. Step 3) Seg. Line Dist. Compare complete cumulative time (TΣ360) with period (P) from Kepler's Third Law. Adjustment requires increase by 0.76%; much less than 5.9% needed for 30° increments. Achieve even more accurate results with smaller angular increments. For example, 1° increments require even smaller adjustments (0.11%) for Step 8).